60 veterans stood as honor guard at a cemetery in the town of Gardiner, Washington during a ceremony to replace three special military coins that were stolen from veteran Marvin G. Shields’ graveside earlier this month. Bill Pletcher led the effort to replace the ornate brass medallions earned during the Vietnam War, even securing a new admiral’s coin, a request expedited by the Pentagon. 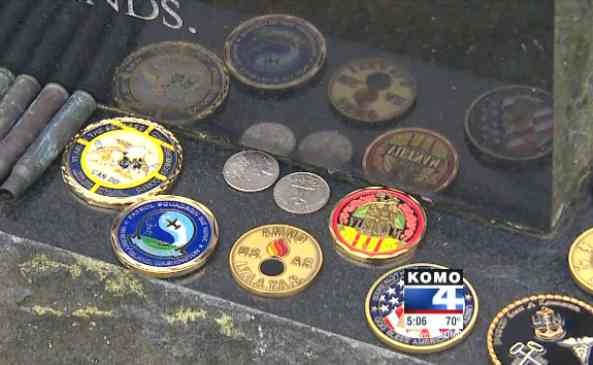 Other visitors to the cemetery left coins before the ceremony, and now there are more than two dozen challenge coins, which bear various military insignias, resting on Marvin’s headstone. Shields earned a Medal of Honor for saving lives during a 1965 battle in South Vietnam, that claimed his life.